After 848 games, veteran forward Steve Ott has retired from the NHL, the team announced Thursday. After a long playing career split between the Dallas Stars, Buffalo Sabres, St. Louis Blues, Detroit Red Wings and Montreal Canadiens. The retirement wasn’t the biggest news of the day, however, as Ott was also hired by the Blues as an assistant coach. 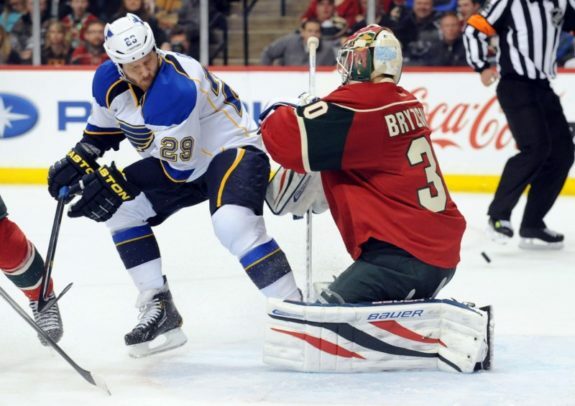 Ott was acquired by the Montreal Canadiens at the 2017 trade deadline from the Detroit Red Wings before re-joining the Blues on Thursday. Ott was originally drafted with the 25th overall pick in 2000 and compiled 109 goals and 288 points to go along with his 1,555 penalty minutes in 848 games. Serving as the co-captain of the Buffalo Sabres during the 2013-14 season prior to the Blues acquiring him at the trade deadline of that year, Ott proved to be more than just a fighter on the ice. Respected by his teammates and peers and considered a character player through and through, the Blues are hoping that Ott can enter this next stage of his career with the same levels of success. For the Blues, this is another change to the coaching staff after firing Ken Hitchcock during the season and promoting Yeo early into a role he was expected to take over next season. Ott is prepared for the opportunity, however, and is ready to start the next chapter of his career. After being eliminated in the second round of the 2017 playoffs, the Blues were once again left hoping for more heading into the offseason. Still without a Stanley Cup and without a Finals appearance since the 1970 loss to the Boston Bruins, the Blues are making moves to try and change the landscape of their franchise. Over the last few seasons, key pieces from the team’s core have been moved, including but not limited to former captain David Backes, TJ Oshie, Kevin Shattenkirk and Hitchcock. With Ott back in the fold, the team is hoping that this continued shakeup will finally reward them with results. With a solid core still in place that includes Vladimir Tarasenko, Paul Stastny, Jaden Schwartz, Alex Pietrangelo, Jay Bouwmeester and Colton Parayko among others. Only time will tell if this current iteration of the Blues will finally find the Stanley Cup win that the franchise and city so desperately covet, but for Ott, this is just the beginning of the next chapter in his life. Many players have made the transition from player to coaching and managerial positions, including Martin Brodeur who also works on the Blues as the assistant general manager and former goaltending coach.